This history was provided by James Kline a former officer of the 87th APS. Around 2000, Jim went to the MAJCOM historian’s (AFRC/HO) office to secure this information of the unit’s lineage. 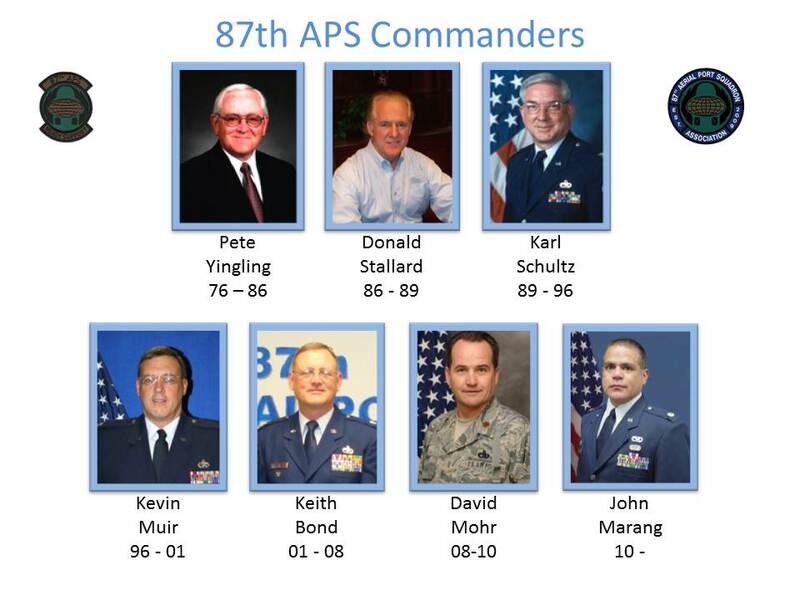 Jim went on to became the commander for the 32th APS in Pittsburgh PA.
8 June 1960: The unit was constituted and activated as the 87th Air Terminal Squadron at McClellan AFB, Sacramento, CA. It was allotted to the Air Force Reserve and assigned to the Continental Air Command. For the next thirteen years its parent organizations were a variety of Air Reserve Centers/Regions. 1 July 1967: The organization was redesignated the 87th Aerial Port Squadron. 1 August 1968: Unit relieved from HQ Continental Air Command and assigned to HQ Air Force Reserve. 1 August 1973: The unit was assigned as a subordinate squadron to the 349th Military Airlift Wing (Associate). 1 Dec 1976: Unit undergoes a station change and is reassigned to the 302nd Tactical Airlift Wing (Lockbourne AFB, OH) as a Geographically Separated Unit located at WPAFB, OH. 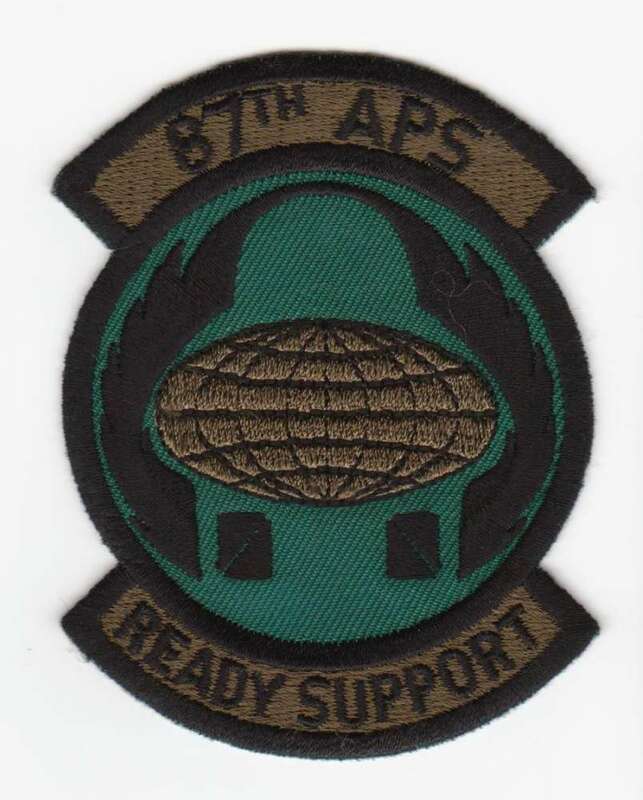 1 April 1981: Unit is reassigned to the 907th Tactical Airlift Group (Rickenbacker AFB, OH) as a GSU located at WPAFB, OH. In April, 1993 the 40th Mobile Aerial Port Squadron and the 87th Aerial Port Squadron merged into one large “Super Port“. The 40th MAPS relocated to Wright-Patterson AFB, Ohio from Rickenbacker AFB, Ohio. Unit Emblem Heraldry – This describes our patch before it went to the subdued colors. Description: On an ultramarine blue disc, a white oval globe grid lined in ultramarine blue above two brown crates with white centers in base and between a pair of yellow wings fimbriated gold brown; all within a narrow white border. Attached below the disc a yellow scroll edged with ultramarine blue border and inscribed READY SUPPORT in ultramarine blue letters. Attached above the disc a yellow scroll edged with an ultramarine blue border. Significance: Blue and yellow are the Air Force colors. Blue alludes to the sky, the primary theater of Air Force operations. Yellow refers to the sun and the excellence required of Air Force personnel. The globe and wings indicate the unit’s worldwide capability to deliver both cargo and passengers. The crates refer to the squadron’s cargo responsibility.